A paper on these findings has been accepted by the Monthly Notices of the Royal Astronomical Society and a preprint is available online. The authors of this study were Gabriele Ponti (Max Planck Institute for Extraterrestrial Physics), Barbara De Marco (Max Planck), Mark Morris (University of California, Los Angeles), Andrea Merloni (Max Planck), Teo Muñoz-Darias (University of La Laguna, Spain), Maica Clavel (CEA Saclay, France), Darryl Haggard (Amherst College), Shuo Zhang (Columbia University), Kirpal Nandra (Max Planck), Stefan Gillassen (Max Planck), Kenji Mori (Columbia), Joseph Nielsen (Massachusetts Institute of Technology), Nanda Rea (University of Amsterdam), Natalie Degenaar (University of Cambridge), Regis Terrier (University of Paris), and Andrea Goldwurm (CEA Saclay). I'm using this website for an astrophysics class. This is epic. Sagittarius is the central region of our home galaxy which is commonly called The Galaxy or The Milky Way Galaxy. I believe everyone may be looking at black holes backwards and they may be creatures not destroyers. The article by Ponti et al reached publication status in July 2015. What's curious is that time dilation prevents anything ever being seen by outsiders to cross the event horizon of a black hole. 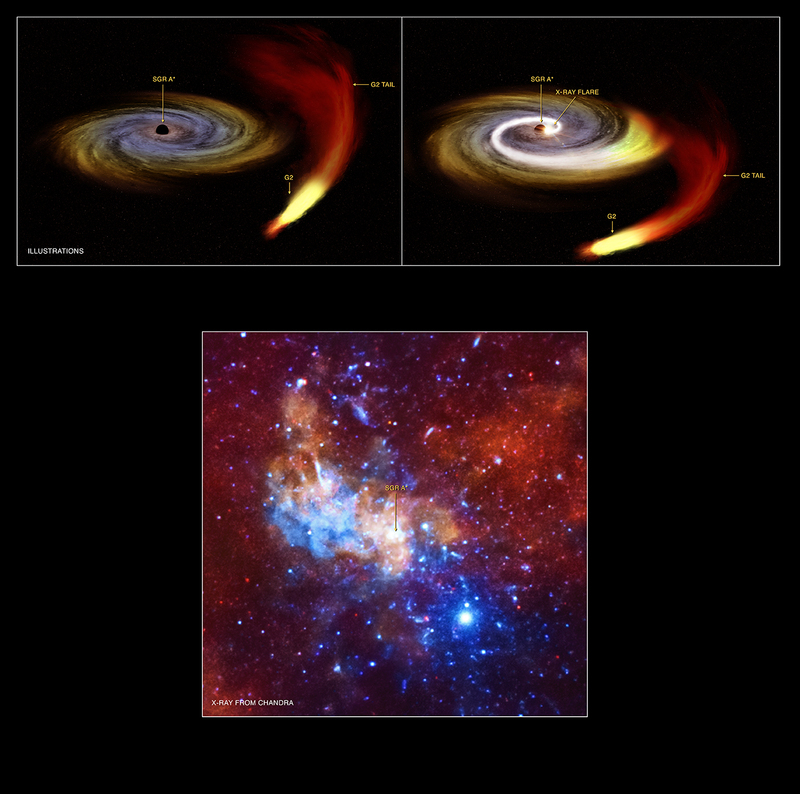 We're also led to wonder whether Sagittarius A will eat the rest of the Milky Way given enough time. In addition, we have a big problem, which is called sensitivity in measuring devices... what if, in the future, we advance the sensitivity of the measurement system, and we measure some energy coming from a black hole? How much of the theoretical models would be destroyed? This question is consistent with what would happen if in the future we measure that the speed of light is not constant, and varies throughout the universe? I do not think black holes, as many understand them, exist. I think we do not yet know clearly the essential laws of physics, and we base, almost dogmatically, in some theoretical models, which only partially explain something of the nature we study. Isn't Sagittarius our home galaxy? These images are amazing and naturally creates so many questions in mind. What if the Universe continually produce black holes? Will the universe collapses? This seem to be what the Big bang evolved from. Theoretically speaking. Oppenhiemer and Wheeler used to argue over the nature of Black Hole physics and not much else has been added to this discussion except astronomical observations. Perhaps, some real imagination is required to think the impossible and I not talking the current paradigm nor wormholes in space. Black holes will be part of the natural evolution of energy and not bound by the state of our scientific understanding at this moment it time. 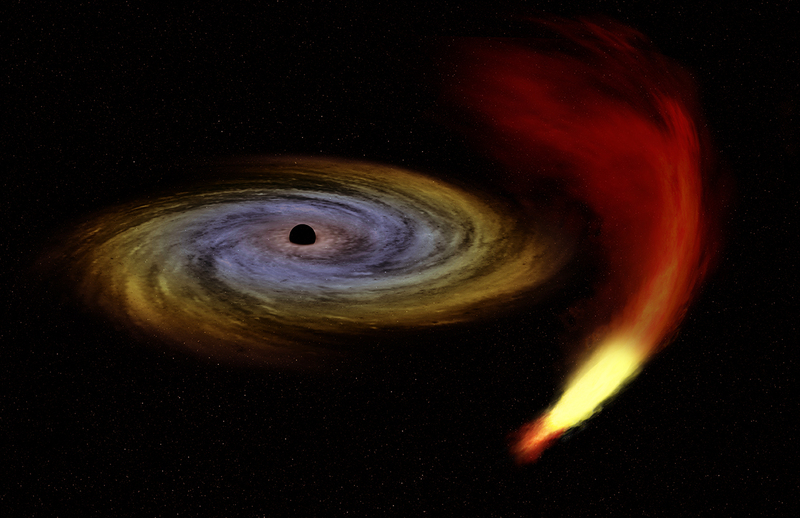 How many black holes have been identified found in our galaxy? As of now there is no BLACK HOLE near to earth. Hunt for black hole requires very powerful telescopes. Another way to detect these objects are by gravitational lensing. This is extremely extraordinary. Is this activity normal to the black hole in the center of the galaxy? So do we have to worry about objects hitting our Sun and like the black hole our Sun produce a flare that can destroy Earth? Years ago, my brother Anthony, my friend Joe & I observed Sagittarius A by using a shortwave radio - a simple die pole antenna. When we set the shortwave to 20.5 mega hertz, we were able to get a loud hiss which came from the central black hole. Any Black holes near the earth, any danger effects earth in future? About 38 light years across.